A man struck by lightning three months ago remains in hospital, a court has heard. 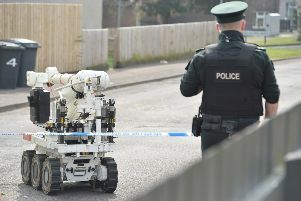 George Allen, 36, had been due to attend Lisburn Magistrates’ Court but defence barrister Joel Lindsay confirmed that he was seriously injured in the incident in June and “is still in hospital”. Mr Allen, from Rampart Street in Dromore, Co Down, is on bail accused of inflicting grievous bodily harm with intent on Andrew Riley on June 5. He first appeared in court the following day and was granted bail but tragedy struck that afternoon when, attending his children’s school sports day, he was struck by lightning. Staff had to use a defibrillator on Mr Allen who was left in a critical condition in intensive care and spent a month in a coma after the freak accident at Killowen Primary School in Lisburn. His son and daughter were also hurt but were released from hospital within a few days. In court on Monday a prosecuting lawyer said the PPS had received medical evidence on the alleged victim but they were still awaiting the summary of Mr Allen’s police interviews which would be required before any decision was taken regarding the prosecution. Following a prosecution application, Deputy District Judge Philip Mateer adjourned the case to October 24.